Note: Themer layouts created in Beaver Themer can only display lists of products, not lists of categories or subcategories. In other words, if your WooCommerce product display settings are set to Categories or Subcategories (as shown in the following screenshot), a Themer layout that applies to those pages will override those settings and show products instead. Here's how to create a Themer layout for a WooCommerce archive page. Applies to the Shop page (or an archive page you have designated instead of Shop). Applies to any single Category archive page, which will list all the products assigned to that category. Applies to any single tag archive page, which will list all the products that are associated with that tag. Add more location or exclusion rules so the layout applies only to the archive pages you want this layout to apply to. Select the Products template, then click Replace existing layout. Now you have the initial layout for a WooCommerce product archive page. In the Preview box at the top of the screen, select the type of product archive you want to preview as you modify the page layout. Publish or save your Themer layout when you're done. Tip: It's easier to design the layout if you already have a couple products created or have imported the set of WooCommerce sample data. You can preview the list of products in the archive as you work and see the information that will appear. 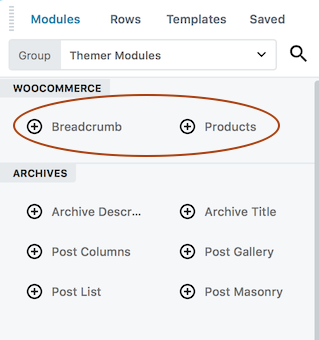 When you edit an Archive-type Themer layout and have the WooCommerce plugin installed, there's a special content category in the Themer modules group of the Content panel called WooCommerce modules. The Archive-type Themer layout has two WooCommerce modules: Breadcrumb and Products. See the Related Articles for a detailed description of each module. Note: The WooCommerce modules that you use in Beaver Themer to lay out archive pages have standard WooCommerce functionality because Beaver Builder uses the WooCommerce API. The advantage of the WooCommerce modules is that they provide a convenient way to style the page and show or hide various WooCommerce components.